Coriander is very popular throughout the world and is used vastly as a flavoring or substitutes in many cuisines. Coriander with its unique smell and taste is also known by several names such as cilantro, Mexican parsley, Spanish cilantro, Chinese parsley, etc. Coriander in Hindi is known as Kotgmir or Dhania; it is among the few plants that provide both spice as well as herb. Generally, the word ‘cilantro’ is used for the fresh herb, and the word ‘coriander’ is used for the seeds or ground seeds. Botanically Coriander is named as “Coriandrum sativum” and belongs to a member of the Apiaceae or Umbelliferae family. Coriander is native to the Middle East, Mediterranean region and in southwest Asian regions, but today it is cultivated in most parts around the world. Endogenously this plant is believed to be from Greece, but become a traditionally used spice in nearly all the Asian countries. It is an annual herb which is extensively cultivated all over India, mainly for its fruits and for the tender green leaves. In India Tamil Nadu, Andhra Pradesh, Rajasthan, Madhya Pradesh and Karnataka are the largest producer of coriander. Plant: It is identified as cilantro in the west. This herbaceous plant grows up to 2 feet in height with branching stems. Leaves: The leaves appear to be deep green delicate, bald, bi or tri-lobed leaves. Flowers: The mature plant produces small light pink color flowers that later on turn into spherical or oval-shaped fruits (which are seeds). Seed: The seeds are oval, measure about 4-6 mm in diameter with interior hollow space containing two vertical vittae containing some significant essential oils. The seeds are ready for harvest-time as the plants turn brown, leaves begin to dry and fall. Unripe seeds are light green and taste bitter. To harvest, the crop is cut, tied in small bundles, and dried in the sunlight for a couple of days. To separate the seeds, either the bundles hammered with stick or a lightweight roller used to wear off the pods. Today, coriander is seeds and leaves are being used worldwide for culinary and medicinal purposes. Below here are some of the benefit which is very useful for health. Coriander seeds are also useful in the treatment of immoderate menstrual cycle. To use is quite simple, take six grams of Coriander seeds in half a litre of water and boil it in a vessel until the decoction comes to a half in quantity. Now add a little sugar to it and consume it while it is little warm.It is a well-known and one of the popular home remedies for menstruation. It has a property that aid in proper emission from the endocrine glands and also helps in proper secretion of the hormones. Besides this it, furthermore, promotes proper menstrual cycles and reduces pains during periods. Coriander has a natural diuretic drug property, which can benefit to reduce weight loss. Coriander is a dried seed with sweet-smelling qualities that quicken digestion. Coriander is also used for healing of dermatitis rashes and hives. Coriander is as well useful to purify the blood and to reduce gas. Coriander seeds have Cineole, that is one of the 11 ingredients of the essential oils, and linoleic acid, existing in coriander, acquires anti rheumatoid and anti arthritic properties, that are very helpful for swelling caused due to these two reasons. For other people, such as swelling due to nonfunctional of kidney or anemia, it is viewed to be advantageous to some degree, as some of the ingredients help elimination of extra water from the body. Some of the acids present in coriander seeds like oleic acid, linolenic acid, Stearic acid, palmitic acid and ascorbic acid are very useful in lowering the cholesterol level in the blood. It also reduce the cholesterol buildup along the internal walls of the blood vessels and veins. Some of the basics of essential oils in coriander such as Borneol and Linalool are helpful in digestion, for proper functioning of liver, bonding of bowels and are also very helping to cure diarrhea. It is as well beneficial in diarrhea caused by microbial and fungal action. As basics like Cine-ole, Borneol, Limonene, Alpha-pinene & beta-phenylalanine have anti-bacterial effects. In addition, the fresh coriander leaves are superior appetizers. Citronella basics of essential oils in coriander, is an outstanding antiseptic. In addition, unlike components have anti microbial and healing effects that do not let wounds and ulcers inside the mouth go worse. They aid curative up of ulcers and freshen up the breath. Due to its rich aroma of coriander and its essential oils, it is apart from being an exceptional appetizer. Aids in proper release of enzymes and digestive fluids of the stomach also stimulate digestion and peristaltic motion. It is useful in treating troubles like anorexia. The essential oils in coriander are rich in anti microbial, anti oxidant, anti infectious and detoxicating basics and acids. The properties of iron and vitamin-C also strengthen the immune system. These properties aid to prevent and cure small pox. They also reduce the pain and have a relaxing effect on pox patients. Coriander has lots of anti oxidants like vitamin-A, vitamin-C and various minerals like phosphorus as the essential oils in it, that prevents aging of eye, macular deterioration and comforts eyes against stress. Coriander is a very good sterilizer and has anti-microbial properties that protect the eyes from infectious diseases like conjunctivitis. Although Anxiety is believed to be a mental disorder, but its effects are often physical. The physical in the sense, anxiety can make you feel nauseous and even cause stomach pains, headaches etc. Today many people around the world are more anxious than ever.The best way to prevent anxiety attacks is by introducing Coriander (cilantro) in your diet. Coriander has sedative qualities that soothe the nerves system and reduce stress symptoms; it is also rich in vitamin B so it can also be good for your mind. The characteristic aromatic flavor of coriander seeds is due to its properties like fatty acids and essential volatile oils in it. Besides this, it has many enormous properties like fatty acids, petroselinum acid, oleic acid, palmitic acid and linoleic acid also known as omega-6. In addition to this coriander, seeds also have essential oils like a-pinene (10%), linalool (68%), camphene, geraniol, terpine etc. All these properties together make coriander seeds an active element that is useful to boost digestive system, flatus-relieving and anti-flatulent properties. As like other spices, coriander is also rich in of dietetically fiber. 100 g seeds provide 41.9 g of fiber. A lot of this fiber is metabolically inert insoluble fiber that helps to raise a bulk of the food by absorbing water throughout the digestive system and aid easing constipation situation. 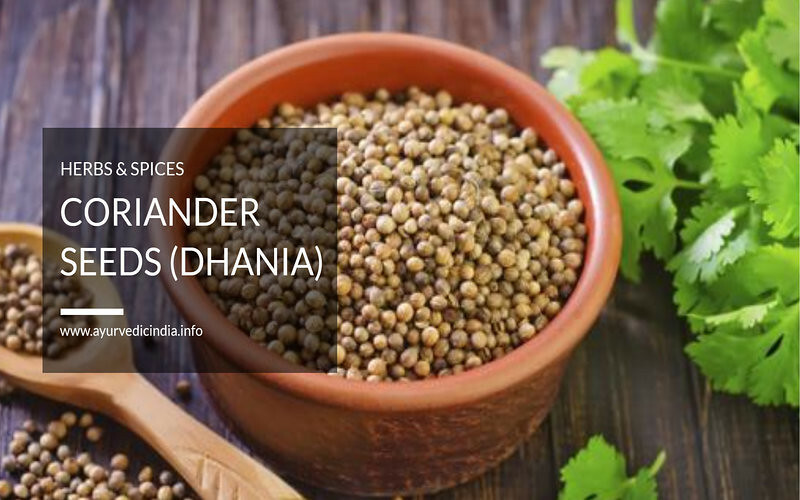 Coriander Seeds possess a dietary fiber that binds to bile salts, which are produced from cholesterol. It then lowers the re-absorption in colon, this way it helps to subordinate serum LDL cholesterol levels. It in combination with flavonoids as anti-oxidants, along with fiber of coriander helps to defend the colon mucus layer from forming cancers. Coriander seed is a unique dry spice that is loaded with vitamin C with a large amount of anti-oxidant and vitamins. It has been found that 100 g of dried seeds has 21 mg or 35% of recommended dietary intake (RDI) of vitamin. The Coriander seeds have an excellent source of minerals like magnesium, iron, calcium, copper, calcium, zinc and potassium. Copper is principal element that is needed or the production of red blood cells. Iron is an element that is necessary for cell metabolism and in forming red blood cell.Zinc is another important element that is required during the growth and development of sperm creation, digestion and for the nucleic acid synthesis. Potassium is a main element that helps to control body cell and fluids, in addition it helps in regulating heart rate and blood pressure. Manganese is an element that is used by the body in forming powerful anti-oxidant enzyme and superoxide dismutase. Much research has been performed on Coriander, and it has been found that it has strong anti-histamine properties. It is a property that can help to reduce the effects of seasonal allergies and hay fever. In addition to that coriander, oil also has a property that can help to reduce allergic, which are caused due to in contact with plants, insects, foods and other subject matters that can cause allergic skin reactions. When consumed it you can prevent anaphylaxis, Urticaria and dangerous swelling of the throat and glands. So it is not a bad idea to consume it to protect against allergic reactions, especially in the condition in which it is difficult to know what you may be allergic to for the first time. Note : Although Coriander have been used without side effects for centuries, some people can have allergic reactions such as rashes, difficulty breathing, itching, swelling of the face / throat, dizziness, etc. Consuming coriander seeds have no side effects, but if you are prone to the above problems, it is advisable to consult your doctor before using this spice. I did not realize that coriander has so many benefits. This is a very good read. But I’m just wondering if it’s a diuretic then is it safe to use during diarrhea? cause I’m worried about dehydration.